Two Sundays ago, I attended a great seafood-focused forum (a collaboration between Let’s Talk About Food, the Museum of Science, New England Aquarium, the Center for Health and the Global Environment at Harvard Medical School, Chefs Collaborative, and the Cambridge Science Festival). Often, when I refer to the subject of sustainable seafood, I jokingly throw in the description word “murky” as a way to let the person I’m talking to know that there are a multitude of factors involved in choosing which seafood to put on the menu. Chefs Collaborative members Barton Seaver, chef/author of For Cod and Country, and Gordon Hamersley, chef/owner of Hamersley’s Bistro in Boston, along with Paul Greenberg (author of Four Fish) and others from the New England seafood community came together and described their own frameworks for doing the right thing. 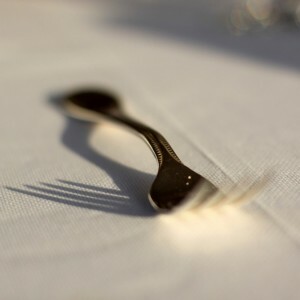 If one thing was clear, it was the fact that we all need to be more conscientious about what we put into our mouths, because, as Barton said, the guiding hand of natural selection is holding a fork. Read on for an account of the afternoon by Sue McCrory, the host/editor of Public Radio Kitchen. If there was a single message that attendees walked away with on Sunday at the New England Seafood Teach-In, it was this: eat responsibly. A familiar call. We know, we know — we should all eat responsibly. But what does this actually mean in the context of fish? When it comes to sustainable seafood, the waters are muddied by myriad factors, not the least of which is the chain of decisions you make (or don’t) when you elect to eat fish. Here’s a sampling: ‘where will I buy it…which fish will I choose…how does that taste…was it farmed or wild caught…was the way it was caught hurt the sea floor, the future of the fishery, other marine wildlife…how much of all this matters to me?’ And don’t forget your wallet. Sunday’s Teach-In taught us, in essence, that eating fish responsibly means setting priorities and deciding whom to trust. But the two are wedded. And here’s the kicker, repeated more than once by different participants at the Teach-In: any fish you see in the case is a priori “sustainable” because the government regulates it, heavily, to be such. Taken in combination, all this is enough to make you throw up your hands in despair were it not for seafood’s being so darn tasty, so darn healthy and so utterly important a protein for a majority of the world’s population. Attendees got an introduction to the science and numbers behind the fishing industry in the first half of the Teach-In, followed by a sense of what factors drive those who purchase or present fish for our consumption. In Panel 1 “Counting the Fish,” John Williamson, President of Stellwagon Alive!, observed that here in the Northeast we’ve got some of the best science in the world as it relates to determining catch levels and sustainable yields. Yet in his view we need to remain cognizant of what science cannot tell us and manage the uncertainties. Vito Giacalone, himself a fisherman and the Chair for Governmental Affairs for the Northeast Seafood Coalition (NSC), argued similarly, but more passionately. Due to heavy regulations which fluctuate often, fishermen bear the economic burden when science does not (or cannot) answer all the questions about the present and future health of a fishery. While we wait for banks to ‘heal’ and stocks to increase, create a legal system, Giacalone argues, that doesn’t destroy the fishing industry in the meantime. Fishermen are a local resource. They and their fleets are aging in an industry notoriously hard to break into. During Panel 2, “The Business of Seafood,” the conversation turned relatively lighter in tone, and the information more accessible. All participants agreed they currently look to farm-raised fish more often. Skip Bennett of Island Creek Oysters actually runs a fish farm. He believes strongly in the moral need to create food in an environmentally sound way. Oyster farms do this in spades. Hamersley and Roger Berkowitz of Legal Sea Foods agreed on the deleterious effect of the “noise” generated by the media over the issue of sustainable seafood. Whole Foods’ recent decision to discontinue carrying some Atlantic cod is a case in point: neither Berkowitz nor Hamersley places credence in the Monterey Bay Aquarium’s Seafood Watch Program recommendations that- Whole Foods followed in their new policy regarding cod. Most fishermen by definition are “conservationists,” Berkowitz offered, because they must look ahead. Their livelihood depends on it. (Giacalone said the same during his talk.) Carl Salamone of Wegman’s observed that the local fishermen he’s been working with have proven wholly amenable to bringing in fish ‘on spec’ under agreed-upon, sustainable methods. In a nutshell, then, how does one eat fish responsibly? Be a “conservationist at the plate” was Hamersley’s pearl of wisdom. Inform yourself over your fish choice, and eat six ounces of it, not eight, with generous sides of fresh vegetables. Train yourself to be less “protein-centric,” echoed chef Barton Seaver, a National Geographic fellow, who gave a rousing closing address on the moral responsibility of each us to be “sustainable eaters.” We can impact the health of our oceans, the fate of our planet, if we each cut back our consumption of environmentally costly foods (e.g., meat, bluefin tuna) and bring our love of food home to our dinner tables. Food is, at its essence, a social endeavor, and one that unites us all.